Results Oriented Reliability and Maintenance Management is an inspiring source of knowledge in reliability and maintenance management, leadership, execution and practical tips. 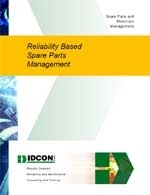 This maintenance management book is comprised of independent reliability and maintenance articles on a wide variety of subjects. It affords the reader ingenious insights and solutions to everyday maintenance management problems. Topics covered include productivity, competitiveness, failure analysis, teamwork, organizational structures, key performance indicators, benchmarking, reliability-centered maintenance, implementation of world-class reliability and maintenance practices, the new role of the supervisor, cost-cutting, flexibility, multi-craft, preventive maintenance inspection intervals, and many more topics. This preventive maintenance book is a must have for all maintenance professionals. It is a unique resource for improving maintenance management processes and learning smart preventive maintenance (PM), condition monitoring, inspection and troubleshooting techniques on a wide variety of components, including pumps, motors, gears, bearings, chain, pipes and valves, couplings, seals, fans, lubrications, lifting equipment, hydraulics, pneumatics, compressors, steam, electrical systems, etc. Condition monitoring and PM techniques are presented, together with inspection tools and examples of how to inspect and prevent failures for a number of standard components. This book carefully explains how to set up and improve a preventive maintenance program in any industry. The AISTech 2016 Conference Proceedings Digital version contains papers from the technical sessions at steel's premier event of 2016 on a USB drive. These papers offer a wide range of technological advances in the iron and steel industry, including everything from coke production to continuous casting to sensors and automation. This edition of the perennial best seller preserves the core of the previous editions, focusing on the metallurgical and materials evaluation for failure mode identification. Comprehensive information covering the basic principles and practices are clearly explained. Explanations of recent technical advances and new analysis tools have been added.